Ducati, the quintessentially Italian manufacturer of beautiful motorcycles, is looking forward to another good year. Sales are up in many of its major markets, and 2018 saw North American sales drop only slightly from their 2017 peak. The company is reveling in its niche as a builder of bikes that are gorgeous, fast, and have impeccable handling. Ducati is often compared to automobile builder Ferrari in its exploitation of its spot in the marketplace. Like Ferrari, Ducati has invested heavily in racing. Unlike Ferrari, Ducati has devoted part of its model range to bikes that, while not cheap, are definitely affordable by more consumers. “We carve out our own niche,” Jason Chinnock, CEO, Ducati North America, said. While Ducati’s eye-catching sportbikes get most of the press, the company, now owned by the Audi division of Volkswagen, actually sells a diverse range of products. The Scrambler Ducati brand, introduced in 2015 and which often serves as an entry to the wonderful world of Ducati, has proven itself very popular. The Monster line is celebrating its 25th anniversary and claims to have launched the category of naked sportbikes. 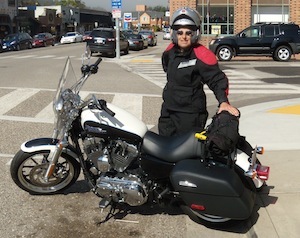 Monsters and Scramblers are especially attractive to women, now almost 20 percent of motorcycle buyers. For model year 2019, the factory is showcasing the 998 cc Panigale V4 R, a production racer that can be ridden on the street. Producing 221 horsepower in street trim, with an optional exhaust that will bump up power to 234 hp, it is the most powerful road Ducati to date. Other new models include three new versions of the 803 cc Scrambler: the flat-track-inspired Full Throttle, the Café Racer and the dualsport Desert Sled. Three Scrambler models now come with a larger 1079 cc powerplant. The Diavel and the Hypermotard have both received upgrades, as has the Monster. Chinnock points out that people buy Ducatis because they form a visceral connection to the bike. “There is no logical reason to buy a Ducati. We are essentially in the entertainment business. A Ducati is what people choose so they can have more fun in their lives.” The Panigale is now the No. 1 selling superbike worldwide. 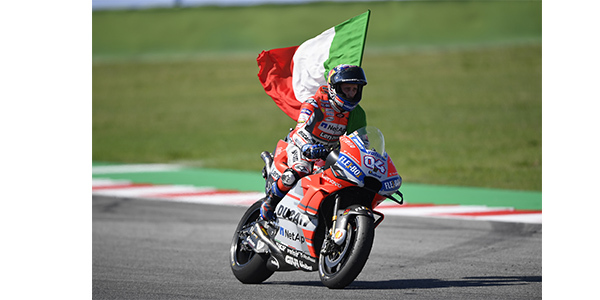 Ducati works hard at maintaining its sport image, fielding both a MotoGP and a World Superbike team. Ducati North America sponsors track days at Circuit of the Americas in Texas and Laguna Seca in California, and is planning to assist a privateer contesting MotoAmerica. “We really enjoy the spirit of the privateer,” Chinnock said. Ducati NA events usually showcase video of recent racing events. In addition to marketing the Scrambler, Ducati has taken other steps to make it easier for the new rider to enjoy a Ducati. Service intervals are now longer, reducing cost of ownership. Ducati NA is also working with Ducati financial services to lower interest rates and monthly payments.